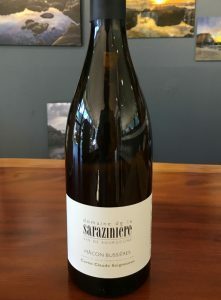 2016 Domaine de la Sarazinière, Mâcon-Bussières Blanc “Cuvee Claude Seigneuret” White Burgundy, France. Philippe Trebignaud along with his son Guilhaume run the Domaine de la Sarazinière, a 6 hectare estate that consists of several single vineyard parcels in Bussières and Serrières, including a block of both Chardonnay and Gamay Noir that was planted in 1926 by the Domaine’s original founder Claude Seigneuret, with this wine (a special old vine cuvee) baring his name in an hommage. While not certified organic, Philippe and Guilhaume work with the conviction that it is the only way to work, with living soils, and holistic practices, similar to biodynamics, the estate is regularly plowed and not ever treated with pesticides and or any herbicides. At 13% natural alcohol this wine feels ripe, but incredibly mineral driven and vibrant with an intense steely and stony core and showing apple, pear and bright lemon fruits along with wet rock, clove and white flowers as well as a bit of peach and chalk. The delicate golden hue and snappy acidity add to the joyous performance and appearance of this poised white Burgundy, it’s a class act and gains depth with air giving a regal mouth feel to this well made and balanced Chardonnay from Domaine de la Saraziniere. Imported by Floraison Selections, this cuvee Claude Seigneuret Macon-Bussieres really delivers for the price, in a blind tasting it gave a good account for itself in a lineup of stars, including a good vintage of Ramonet Chassagne-Montrachet! There is a lot to love about this wine and winery, be sure to search it out, this 2016 is beautiful and impressive wine, especially for the price.